We are back at camp for the summer, and it’s hard to believe we are already half way through our first week. Even a few days is plenty of time for campers to have new adventures! This afternoon we ventured over to our awesome ropes course to see what kind of new challenges campers are discovering. Blake, a Trailblazer in our Upper Camp, was thrilled to share that he climbed “The Centipede” for the first time ever yesterday! He described the experience as “exciting and a tiny bit scary” since he was up so high, but felt happy and proud after he had completed the course! Counselor Nate agrees: “The Centipede is amazing but hard!” he exclaimed. One of many choices for Beaver campers, Adventure Challenge includes both low and high elements as well as a climbing wall. Campers as young as 5 years old have the opportunity to explore climbing through spotted bouldering on the wall and in low elements and challenges close to the ground. 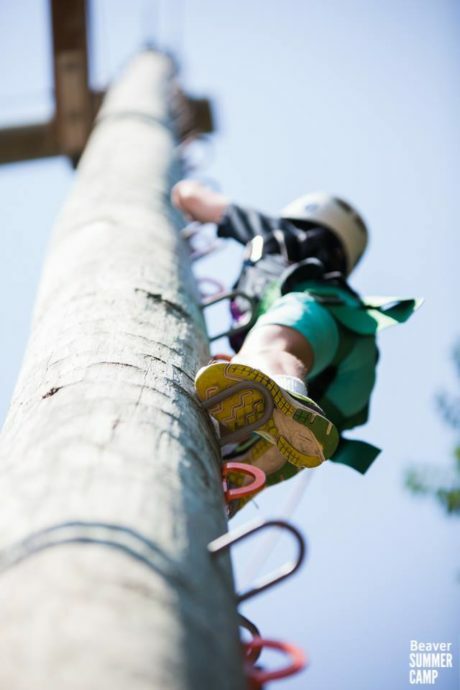 Kids in Middle, Upper, and Senior camps can choose Adventure Challenge as an elective, progressing from low elements to higher climbs as they gain experience. Director Sam Bensley stresses that kids take on challenge by choice, meaning that kids pick options, along with support from their counselors, that are the right level of challenge for their age and experience. Within this model, campers can each experience different individual challenges, helping to build confidence.